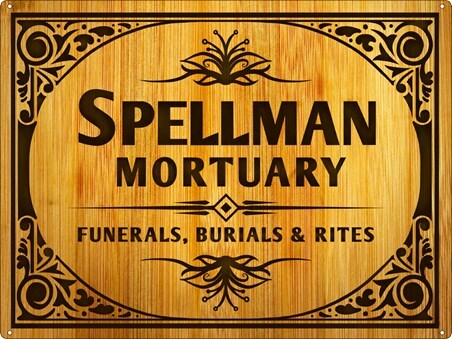 Take a journey to the Spellman Mortuary located in Greendale, owned by the Spellman sisters Hilda and Zelda. It's a place where witches practice their witchery in complete secrecy without the prying eyes of the world. This amazing tin sign is inspired by the Netflix remake of Sabrina, which is an effectively creepy twist on a familiar story. If you remember reading the Archie Horror comics or watching the Melissa Joan Hart 90's sitcom, then this is a must have addition to any wall space for aspiring witches. High quality, framed Funerals, Burials and Rites, Spellman Mortuary tin sign with a bespoke frame by our custom framing service.